TWO ANDANTES BY FERNANDO SOR. OPUS 35, NUMBERS 1 & 14. 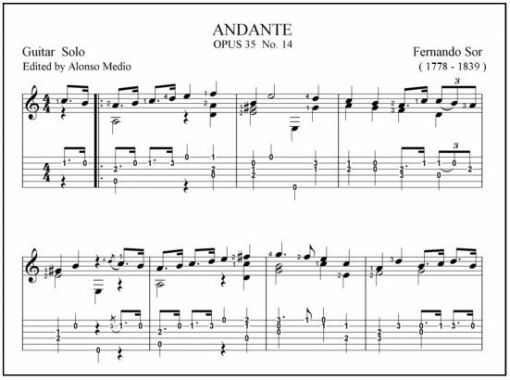 Location: /Sheet music/Guitar Series/TWO ANDANTES BY FERNANDO SOR. OPUS 35, NUMBERS 1 & 14. 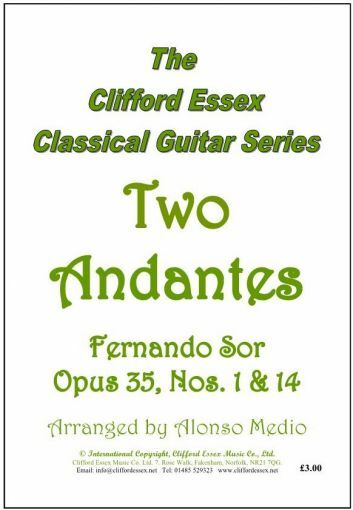 These two tuneful and easy pieces by Fernando Sor are very popular among student guitarists. Sor wrote many simple exercises (and quite a few more difficult ones !) but all of them have the merit of being tuneful. They are the kind of short solo which can give pleasure to the performer and to the listener, even if the player is a beginner. The two pieces published here are from his Opus 35, entitled ‘Very Easy Studies’, although many moderately advanced guitarists will enjoy playing them as a preliminary to more difficult solos. BMG - The oldest fretted instrument magazine in the world.